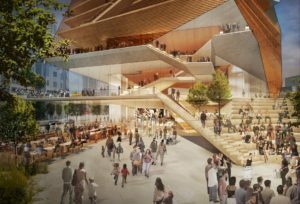 The architects at New York City-based Diller Scofidio + Renfro have revealed their design for the new London Centre for Music. 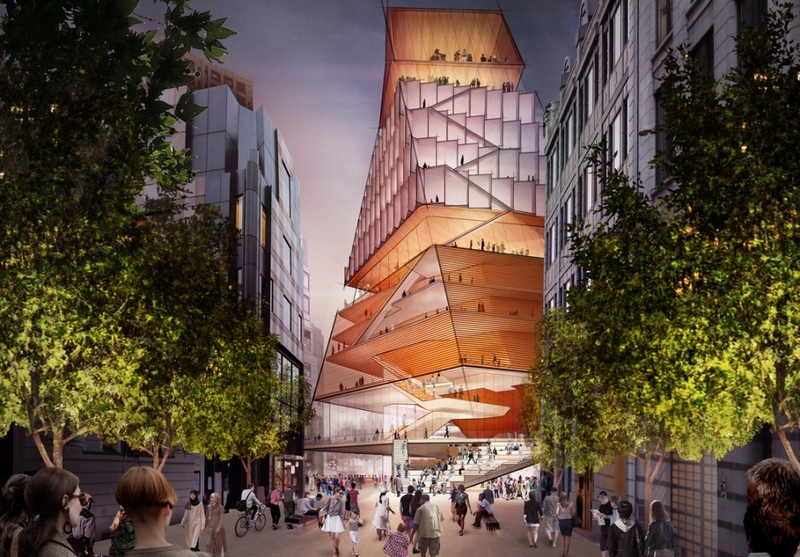 It’s being constructed for The Barbican, the London Symphony Orchestra and the Guildhall School of Music & Drama. 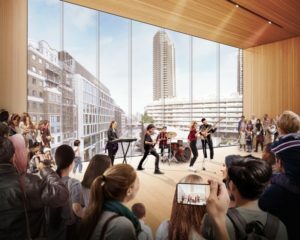 This world-class center for music will repurpose a car-centric space into a pedestrian plaza that will become an iconic new gateway to the City of London’s emerging Culture Mile. The Centre for Music’s design would turn the Barbican’s inwardly focused campus inside out, providing ample, light-filled public space, a world-class concert hall, and much needed learning and outreach spaces. The Centre would be a beehive of activity both day and night—a place where music of all kinds is made, learned, experienced and shared. It would be a place where people want to spend time, even without a concert ticket. The new Centre is designed to unlock the urban potential of its new site at the southern tip of the Barbican complex by reclaiming the existing roundabout, where the automobile’s isolating effects are keenly felt. The localized intervention ties into the long-term vision for London as a pedestrian friendly city with lively urban spaces distributed throughout. 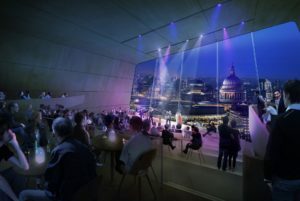 It also stitches together two urban axes: a north-south axis from the South Bank and Tate Modern to St. Paul’s Cathedral, the Centre for Music, the Barbican and beyond, with the east-west axis of Culture Mile, served by the new Crossrail transport network. The new civic space would draw the public from all directions and host a mix of outdoor programs and social spaces that would enliven the area in fair weather. From street level, a set of amphitheater stairs form part of a circulation network that connects to the Barbican Estate’s distinctive Highwalk, and branches up to integrate the building’s tapering stack of distinct volumes: the multi-purpose foyer, the concert hall with its affiliated education and support programmes, commercial floors and an intimate music venue on top. The multi-level foyer presents a porous entry, accessible from the street level and Highwalk. A café and bar, informal flex spaces for research, informal classrooms, and performances would activate the space with social, cultural and educational activities. The lifted concert hall floating within liberates the lower levels and is a visible landmark seen from surrounding streets. 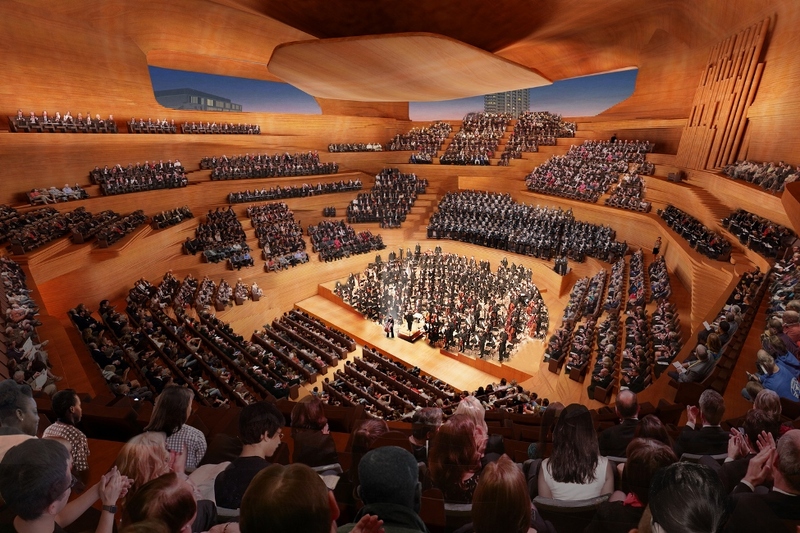 As the heart of the proposed Centre for Music, the concert hall is designed as an intimate and inclusive space for up to 2,000, in which every seat in the house is a great seat. The audience wraps all sides of the stage in a surround-seating configuration. The hall reconciles a bespoke and loose fit approach: tailored for exceptional symphonic sound, yet agile enough to accommodate creative work across disciplines, in a variety of genres. Acoustically controlled pods integrated into the hall seating provide visual porosity for education. A clerestory public gallery with views down towards the stage and out to the city filters daylight into the hall while providing a flexible lounge and event space. Above is the commercial offering capped by a destination restaurant and outdoor terrace with views of the city. 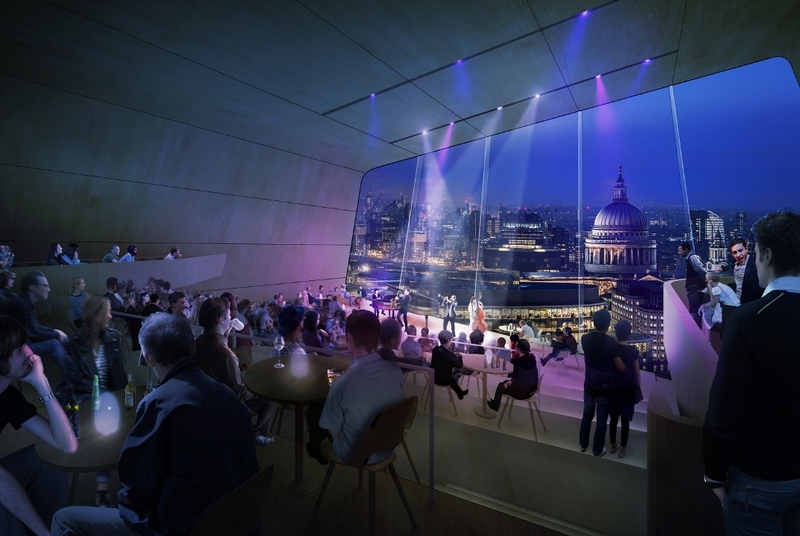 At the very top of the stack sits The Coda, a flexible, intimate contemporary performance and events space with views to St. Paul’s and the London skyline. The Coda acts as a beacon affirming the Centre for Music’s place as a cultural destination for the city. All renderings courtesy of Diller Scofidio + Renfro. See Diller Scofidio + Renfro website.